This is a great idea! 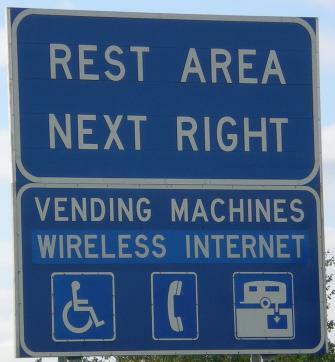 There have been many times I’ve wanted Wireless Internet service in a rest area. I believe that one of the biggest problems with muni WiFi is a lack of understanding the customer. Blanketing a city with WiFi can be a good idea. But why do it unless there is a compelling case for it? Will anyone use it? Will it justify the cost? Or will it be just another way to spend lots of taxpayer money? I like the idea of it’s use for Public Service, Police, Fire, etc (but would it be better just to put EVDO in the vehicles). Where I live, here in Pasadena, I have cheap DSL at home, EVDO on the move. Most homes have access to two telcos (yes, two local telcos on our telephone poles!) and a cable company. So there are at least 3 different physical methods for anyone here to get inexpensive Internet. Why should we have muni WiFi? With all the "noise" on the crowded 2.4GHz spectrum (especially in the multi-floor business areas of town), I doubt that the performance would be satisfactory at much distance. BTW, I have driven around town in the retail/business areas with a spectrum analyzer and it’s very noisy! I really like volunteer activities like SocalFreenet, get people involved with their community. My preference is to let the entrepreneurs build these networks (or volunteers), they’ll spend a great amount of energy understanding their customer. Building smaller city wireless networks seems to make sense to me. Wireless, in parks, rest areas, community centers and other places that foster community. From a post I made to the SOCALWUG mailing list.